Click here for sales information. 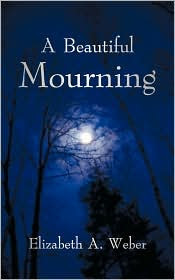 Elizabeth Weber's A Beautiful Mourning is the first book on bereavement that did not cause me turmoil as I turned the pages. It is also an inspirational and literary delight. People who are not in grief tend to avoid books on bereavement and carry on as if they do not exist. Those who are in grief know of these books but can feel challenged by them. I know I do. Each time I start a text or manual on grief, or begin someone's odyssey through mourning, I feel burdened by the expectation of temporarily suspending my own views so that I may impartially asses the material at hand. There was no such burden for me with A Beautiful Mourning. From the moment I read the first paragraph my attention flowed effortlessly, bouyed by the author's natural, graceful, unassuming approach. The story of Elizabeth's life with her husband Bob, Bob's death, and Elizabeth's journey into mourning, is so genuine that it carried me swiftly from chapter to chapter. Then, just for fun, I read it again. When Elizabeth's grief coach offers her an opportunity to explore her grief with an approach called "Seasons of Grief," developed by Carol McLelland, Ph.D., she immediately invests it with her own spirit by being present and paying careful attention to her inner and outer environments. As Thoreau decided to live deliberately in the woods, Elizabeth, a naturalist of the soul, takes her cues from life itself. I will honor my need to stay in bed. I will honor my need to stop and to mourn, and I will do it with full consciousness. As she wraps the blanket of sorrow around her she descends into an abyss and wonders, "...How far will I go?" In March she grieves wholeheartedly, crying as often as she wishes, "marching to the drumbeat" of her own grief. With spring she finds that she doesn't have to try to feel better - the eruption of nature does it for her. She feels a surge of life in her veins. Toward the end of May, Elizabeth becomes restless. "Now I realize that equally as important as diving into mourning is coming out of it." Following her internal guidance system she decides it is time to start a new chapter in her life, and moves to the mountains. Things fall into place. She finds a room in the house of a charming young couple, makes friends, and eventually finds the right house to purchase. During summer she begins taking walks to a pond, where she observes life in all its buzzing beauty, and conceives of an imaginary book with a whimsical title: Everything I Ever Needed to Learn I Learned from My Pond. She also begins arising earlier, takes up yoga, and starts unlearning old habits. In the fall Elizabeth realizes she hasn't cried for months. The holidays are approaching and she is filled with festive spirit; she is reluctant to return to deep suffering. Interspersed with the seasonal observations, and consequent changes in her emotions and insight, are memories of her life with Bob. Several small stories convey just what a wonderful man Bob was, and what a fine husband. Their days living in Hawaii are idyllic. Bob's generous spirit, and good humor are evident in the story of how, near death, he ordered a kind of miracle vacuum cleaner for Elizabeth. There are also episodes of sorrow, crisis, and awakening. Elizabeth passes through a health difficulty, a relocation possibility of false promise, and a terrifying plane ride. Throughout all this her grief flows, ebbs, and resurges. A series of vignettes gives a glimpse of Elizabeth's own humor and personability. Following a rock-throwing incident, she begins taking an active part in the lives of two neighborhood children, which results in sessions of weed-picking and trash-gathering, trips to the movies, and Elizabeth's awe at the spontaneous joy of a young boy who bursts into dance at every occasion. In this way she does not relegate her grief over Bob's death to some past that has been "overcome," but acknowledges that, with her new-found appreciation for life, she has come to recognize the ever-changing ways in which we remember and honor our loved ones. She also give us the inspiration to make our own journeys into the nature of grief, and learning in our individual ways to live with it. A Beautiful Mourning is a beautiful book filled with observations of nature's renewal, life's surprising and sometimes mysterious vicissitudes, and the many unique ways in which human beings can dance with difficult or changing circumstances. The book is also seasoned with elegant and pertinent quotes from the likes of Rumi, Meister Eckhart, and Carol Hannaford. I'm hoping that Elizabeth will keep writing books because she has the talent of combining penetrating insight, entertainment, and literary ability that is rarely found in even the best bereavement literature. More importantly, she is life-affirming in a way that makes me want to live naturally, yet deliberately.